Had to make a wallpaper of one of my favorite games :) 2nd gen is amazing, silver was amazing, but then when soul silver came out, it was BEYOND amazing :D To this day it's probably my favorite pokemon game. I love these legendaries too...I can't even say which is my favorite of the 3, I love them all xD The wall took 4 days for me which was kinda fast I think. o.O I did the line work 1 day, the main characters 1 day and the background another day and a little bit of this morning. it's been a long time that i havent play pokemon games but i sure do remeber this guys. Awesome picture! Oh my! there are two of my fave fave legendaries >.<! 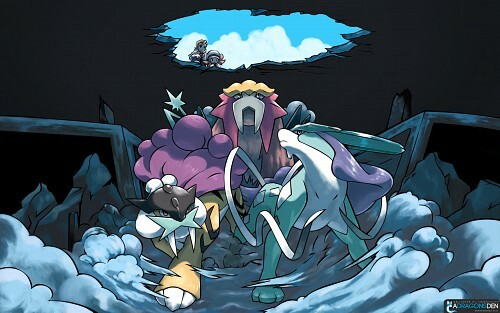 Soul silver is just epicness. My fave gen, too! <3 Just too epic! :D I love the clouds!